As Yakima considers whether the pit bull ban should end, city staff is looking at Tacoma’s dangerous-dog ordinance as a possible replacement. A dog’s behavior, not breed, is the focus in Tacoma. YAKIMA — Late last October, an animal-control officer seized Danika Denton’s dog Romeo, saying it possessed characteristics of a pit-bull terrier. Romeo was among 90 dogs identified as pit bulls and seized last year by animal-control officers enforcing Yakima’s ban on the breed. The number of dogs impounded as pit bulls or pit- bull mixes has held fairly steady over the past few years, with 70 in 2015 and 85 in 2016. That’s about 12 percent of all dogs impounded by the city during that time. So far this year, 24 of the 128 impounded dogs were pit bulls, according to city records. Enforcement of the 30-year-old ban intended to make the city safer isn’t without controversy. Denton says Romeo is her service animal, and she has filed a federal lawsuit seeking an order not only allowing her to bring her dog home, but challenging the legality of the breed-specific ban. According to her lawsuit, Denton says she suffers from post-traumatic stress disorder, anxiety and other issues and that Romeo keeps her from becoming incapacitated if she has an attack. Animal-law attorney Adam Karp of Bellingham, who is representing Denton, said the ban is overreaching, discriminatory and infringes on residents’ right to choose the breed of dog they want. Dog experts say breed-specific bans clog shelters with dogs that are difficult to place in permanent homes and could exacerbate aggression by confining them with few opportunities for social interaction. These concerns and the federal case has reignited discussion among City Council members about whether the ban should remain or be replaced by a stricter dangerous-dog ordinance that focuses on behavior rather than breed. Councilwoman Carmen Mendez said she understands the public-safety issue concerning dog attacks but that targeting a specific breed is unfair to both the animals and residents. The pit-bull ban was enacted in 1987, when reports of pit-bull attacks, some fatal, were sweeping across the country, including the Yakima Valley, as did bans on those types of dogs. Last month, the city of Tieton cited two recent pit- bull attacks as reason to reinstate a previous pit-bull ban that was lifted in 2013. Under Yakima’s ban, the following breeds are included: American pit bull terrier, Staffordshire bull terrier, American bulldog, American Staffordshire terrier breed and dogs mixed with any of these breeds. But in recent years, many bans have been replaced with dangerous-dog ordinances that focus on dog behavior. Yakima has a pit-bull ban and a dangerous-dog ordinance. Now some council members, like Mendez, favor a tougher dangerous-dog ordinance and an end to the pit-bull ban. Last month, council members declined to end the ban but agreed to try to strengthen the dangerous-dog ordinance as a possible replacement. City staff is looking at Tacoma’s dangerous-dog ordinance as a model, said Joe Caruso, city-code administration manager. Some of the proposed changes include identifying dogs declared as potentially dangerous and allowing animal-control officers to pursue such dogs onto private property without a search warrant to seize and remove them. “Tacoma has a successful model,” Caruso said. But City Councilwoman Dulce Gutierrez, who supports the ban, isn’t sure replacing it with a dangerous-dog ordinance is a good idea. She said additional funding would have to be part of a stiffer dangerous-dog ordinance to assure it’s enforced and that owners of dogs deemed dangerous have them microchipped, she said. The city has one animal-control officer but contracts three others with the Yakima Humane Society. Gutierrez also worries that lifting the ban would lead to an increase in stray pit bulls. Many strays already exist, she said, because of irresponsible owners already. Memories of pit-bull attacks remain vivid for some. In 1996, two attacked and killed a 75-year-old man in a wheelchair. A man who came to his aid was hospitalized after being bitten. Last month, a man was badly bitten when he attempted to break up two fighting pit bulls. Police shot and killed one of the dogs when it charged them. But pit bulls account for a only fraction of the complaints and dogs impounded. From 2015 to 2017, pit-bull complaints averaged 210 each year while complaints regarding all other dogs averaged 3,354 a year, according to city figures. Reports of dog bites averaged 70 a year over that same period. How many were from pit bulls isn’t clear because the city doesn’t track dog bites by breed, Caruso said. Animal-control officers don’t just respond to pit-bull complaints; they keep an eye out for them while sweeping city streets for strays and are alerted by other authorities who spot pit bulls while answering police and fire calls, he said. That’s how animal-control became aware of Romeo. Caruso was responding with police to a reported marijuana grow when he spotted the dog and called his animal-control officer. 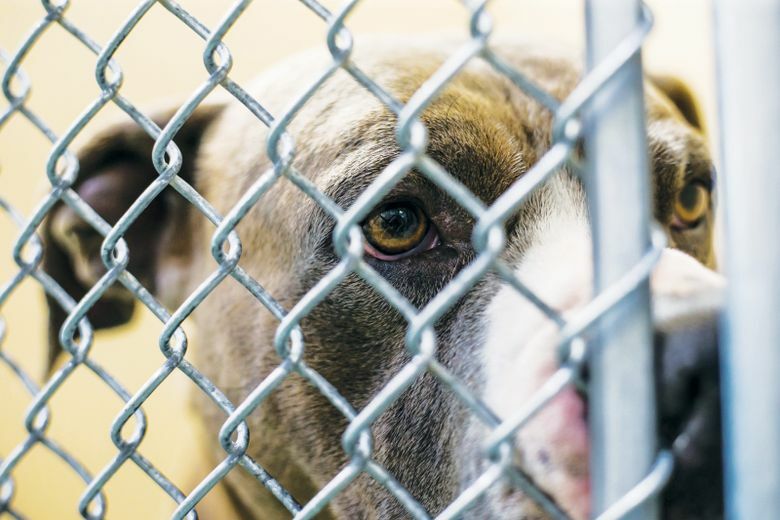 Enforcement of the ban not only strains kennel space at shelters, but is unfair to the dogs, said Kelly Murray, president of the board that oversees the animal shelter. Because of the ban, these dogs cannot participate in a program that socializes shelter dogs by allowing the public to walk them. They remain at the shelter longer than the typical dog because they can only be adopted by people living outside the city where no ban is in effect, she said. “The longer they’re there, the sadder they get,” she said. Pit bulls have been unfairly pegged as overly aggressive, Murray said, referring to research by the American Temperament Test Society, which provides a uniform national behavior assessment program for dogs. According to that research, the temperament of pit-bull terrier type dogs scored better than many other breeds’, including golden retrievers and border collies. And Murray questions the ability of animal-control officers to accurately identify a pit bull, which she said isn’t easy. “The unfortunate thing is dogs are getting identified as pit bulls when they’re not,” she said.